Nanotaco has been reviewed by multitudes of other bloggers—I’m always behind the curve in trying out new places. 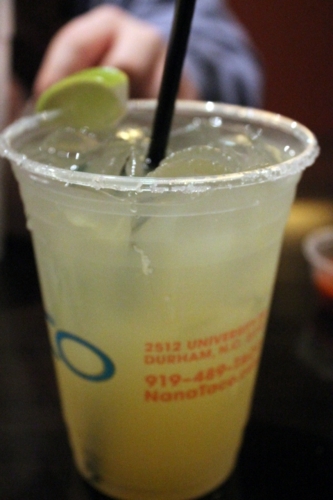 However, this sometimes gives me the chance to weigh in on differences of opinions on a newer spot, and the quality of Nanotaco’s margaritas is one of those local debates, especially in Carpe Durham’s comments. Some people think they are from a mix, some think they are too sour, some think they aren’t sour enough, and some think they are the perfect ratio of sour to sweet. So forming my own thoughts on the Nanotaco house margarita was high on my priority list for my first trip. Also high on that list was trying their torta, because I’ve been on a search for the perfect once ever since I arrived in Durham. That’s one quest that may now be over. 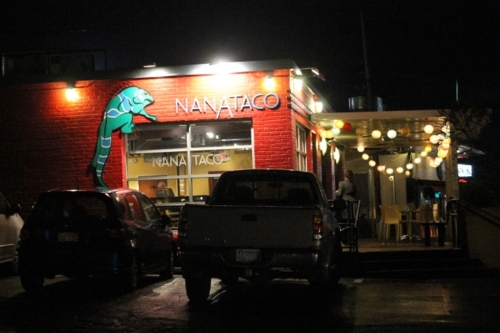 I love the iguana beckoning you into Nanotaco, and the red exterior is inviting to me. Inside, it’s mainly yellow with the chalkboard menu dominating the wall. Some people have mentioned difficulties with the menu set up, but I liked it and didn’t have any problems figuring out what to order. Ingredients are locally sourced as much as possible, and the biggest draw is probably the types of meats they offer for fillings. It’s not just chicken or beef like Mex-Am fare, but it doesn’t stick with only more traditional meats like barbacoa, al pastor, and lengua, either. For an extra $2, you can opt for fillings that play more with Southern themes like crispy pork belly or braised hog jowls, and they are called the dirty meats on the menu. They also have a salsa bar with red, green, and pico de gallo options as well as pickled jalapenos and onions, limes, radishes, and a coleslaw option. Of the salsas, the red option was pretty tasty and packed with dried, roasted pepper flavor. I’d have like more peppers in the pico de gallo. You get a handful of chips with any order, and they were good, but not outstanding in comparison to other options we have in Durham—La Salamandra is still winning in that department. Of course, I started with that margarita, determined to weigh in on the debate. And . . . I don’t have much to offer. It was an average margarita. I think it’s a freshly prepared sour mix rather than a bottled one. I’d drink another, and I suspect it’s the type where the tequila sneaks up on you, but it’s not a margarita I’ll be craving anytime soon. I’d call it a typical house margarita. 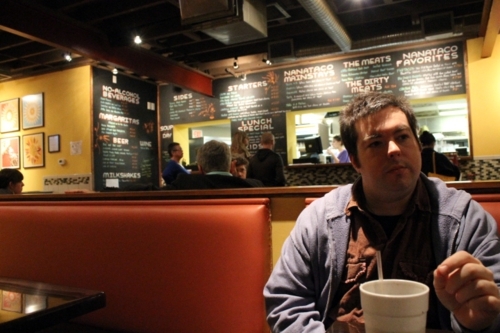 As for food, my husband had a burrito that comes with meat, rice, and beans. He enjoyed it and the smoked duck he chose for his meat. 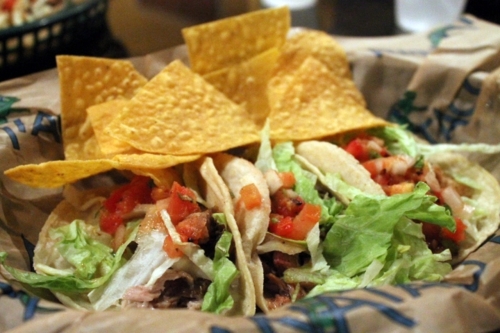 Our friends both tried the three taco option instead, choosing a different meat for each one. They thought the flavor of the smoked duck was too overpowering, but the hog jowl was highly praised as reason enough to come back on its own. They also mentioned that there was too much lettuce on the taco, because it didn’t add anything to the dish. The rest of the meats were fine. 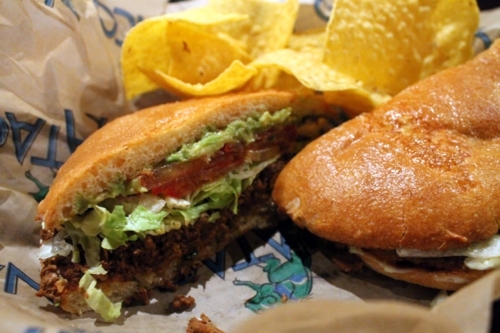 I, of course, tried the torta. Let me tell you a little bit about my torta quest. Before I moved to NC, I had never heard of tortas including beans or ketchup, both ingredients that I can barely tolerate on any meal by accident, much less on purpose. Nanotaco does not foul their torta with such ingredients, keeping it to the lettuce, tomato, meat, onion, jalapeno, mayonnaise, and guacamole I approve of. Okay, they didn’t actually put any jalapenos on mine (why do restaurants leave off listed ingredients—why!? ), but I added in pickled jalapenos from the salsa bar, and it was perfect. I went with chorizo for my meat, and I can’t think of a better choice, because together, it was the right level of sloppy and spicy that I demand in a torta. Possible critiques? 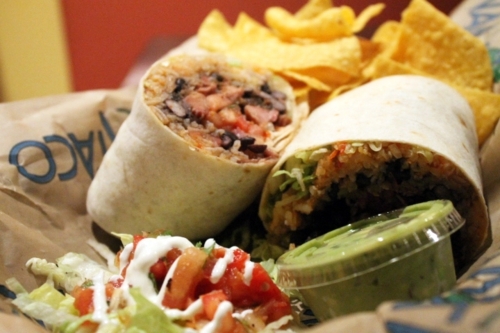 It might be a tad too dry with other meats than chorizo—extra mayo would fix that. The bread was a little greasier and thinner than I prefer. But it’s the best torta I’ve had in the area, hands down. Overall, I was content with my Nanotaco experience. Prices were great for the regular plates, but upgrades like the dirty meats and the guacamole ($2 for chips and salsa, but it’s an extra $2.50 to make that salsa guacamole) seemed too much. My friends will be back for the hog jowl, and I’ll be back for the torta, so I think Nanotaco may be a case of finding just the right menu item that appeals to you, and I have a feeling they have one for everyone. Though I think I’ll opt for one of their shakes over the margarita next time.